When they hear how much of a role my student leaders have in creating our ministry’s vision, other youth workers often look at me as though I’m crazy. They wonder, Why would you entrust your teens with creating your vision? To which I say, Why wouldn’t you? Now, before you decide I’m crazy, let me clarify a few things. As the leader of our ministry, I’m not directionless. I’m not looking to my student leaders to tell me how to lead or do my job. The vision casting we do happens together in a carefully constructed context of year-long discipleship. As part of that discipleship process, my student leaders learn about godly leadership and the church. Because they’re actively thinking and learning about these things, they can be trusted with significant responsibilities, including setting vision. What’s more, because we are in a discipleship process together, I can influence the process. I don’t just stand back, wave my hands, and say, “Have at it.” Instead, I ask questions that help teens move in a direction that makes sense for our ministry. Our vision usually can’t be reduced to 4 words or a catchy slogan. If you asked my student leaders, “What’s your youth ministry’s vision?” they’d probably give you a blank stare because when we’re casting vision, we don’t call it that. That language makes no sense to teens. But, if you asked our student leaders, “What’s your youth ministry about?” they’d be able to tell you. Our vision changes but that’s OK because so do our teens, who graduate from our ministry every four years. Rather than outlast our leaders, our vision is meant to uniquely reflect them (as well as their gifts) as well as who our ministry is in a given year. This year, my student leaders and I crafted the vision for our ministry as part of our discussion about the greater church using Rachel Held Evans’ Searching for Sunday. One of the great things about Rachel’s book is that she highlights several congregations from different denominations. One of them is Kathy Escobar’s The Refuge, which was inspired by both the Beatitudes and the 12 steps of Alcoholics Anonymous. Rachel talks about how The Refuge “extends an invitation” rather than boasts a doctrinal statement. Basically, their invitation consists of several sentences about who they are and what they love. We are all at different parts of our faith journey, but we work together to grow in our faith. We are each others’ tour guides. We have fun learning and growing together. We love to have great discussions and build relationships. We like to be opinionated but also be open to new ideas. We like to broaden our horizons. We encourage being expressive and sharing in discussions. We like to teach each other like Jesus did. We are all questioning and doubting in different ways and are not afraid to disagree. We’re not scared of the hard stuff and we encourage difficult discussions. We know how to be serious but we also know how to let loose and have fun! We’re goofy, and serious(ly) awesome. We accept people for who they are. We appreciate our diversity and recognize the unique talents each individual brings. We are freshmen, sophomores, juniors, and seniors. We are Falcons, Tigers, Hilltoppers, Lions, Warriors, Raiders, and Rams. 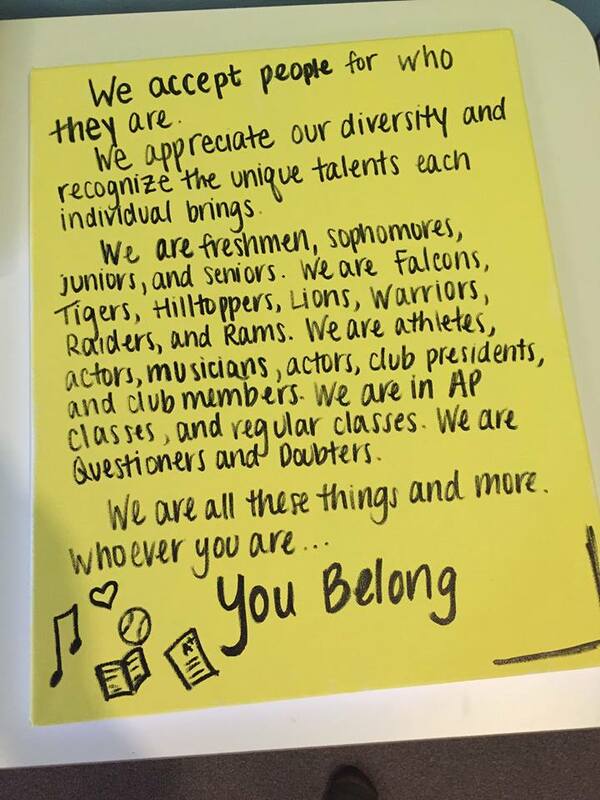 We are athletes, musicians, actors, club presidents, and club members. We are in AP classes and regular classes. We are questioners and doubters. We are all these things and more. Whoever you are, you belong. At our recent Youth Room Makeover, student leaders carefully wrote these words on two canvases, which will hang in our space, a tangible reminder of our vision for this year’s ministry. While these canvases look great, you want to know the best part about this? Because my student leaders created the vision and crafted the invitation, they own it. Their words are an honest reflection of who our ministry is and who we want to be. I have no doubt my student leaders will spend the year making sure these words are true for them, as well as every other person who walks through the doors of our Youth Room – something that may not have happened had I sat in my office singlehandedly creating our vision and then simply told it to my student leaders. Instead of that top-down approach, I’ve got something better: Teens empowered to live out their vision for our ministry.